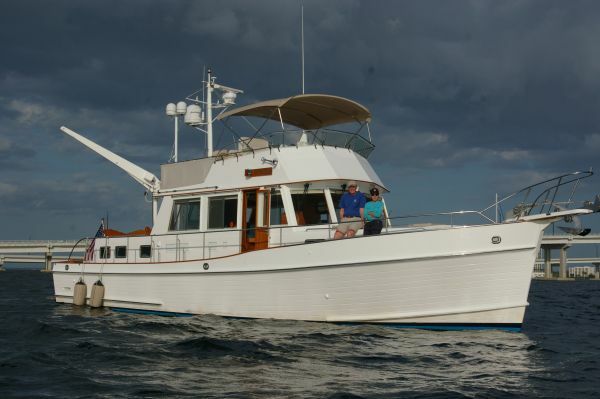 We met the owners of this Grand Banks at the Passagemaker Trawler Fest in Stuart FL. At that time, they were still doing their research and stopped by our booth. 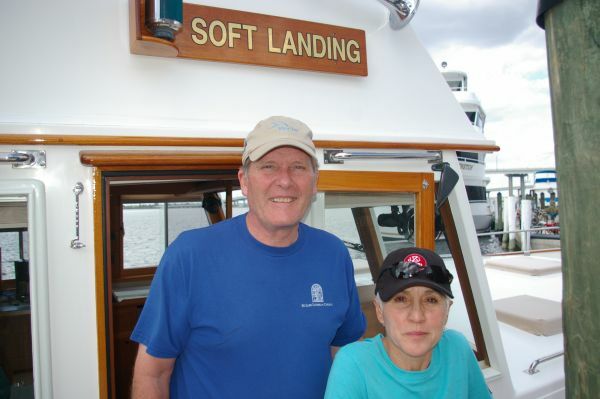 Training was a great concern to them but they soon were at ease as Captain Chris Yacht Services would meet their needs. 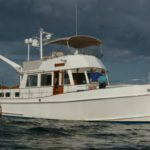 The transition from a smaller power boat to a larger diesel trawler is one of the many adventures in boating where we can smooth the waters for you. 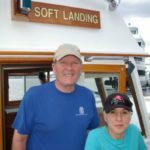 Months later we receive the call: they have purchased a Grand Banks 46 and want to schedule trawler training with Captain Chris. We book two days to help them learn the onboard systems and get comfortable handling the new yacht starting with docking practice. Because the boat was in Alva, FL on the Okeechobee Waterway (OWW) we were in fresh water. A bonus is the calm waters with no current. We start with a below deck inspection and instruction assuring that all systems are GO! Learning at the helm of your own boat can put your mind at ease and practice with a professional captain gives you increased confidence. So practice, we do, first on fixed docks then we move east to a floating dock. After a day of working on systems and docking we spend the evening in a recap and planning session. Tomorrow we will cruise west to Fort Meyers, FL. Up and at ‘em on day two we review docking practice then start our westward cruise. As we travel across the OWW we encounter a draw bridge that the electronic chart plotter shows as an allowable air draft. BUT! the paper chart show a different air clearance and the boards on the bridge show a much lesser vessel clearance. Three different air gaps for the same bridge. This is a great learning experience- DON’T TRUST anything but your eyes. Another way to phrase it is: Look out the window, NOT just at your chart plotter. After confirmation of the actual bridge height we must radio ahead for the bridge to open. This could have ruined a perfectly good second day owning a boat. As we progress west we next encounter a lock. Keep in mind locks and bridges usually have different VHF working channels. In the OWW bridges use channel 9 and locks use channel 13. A little confusing but something that pre planning will make crystal clear. A few locks and bridges later we arrive in Fort Meyers Municipal Yacht Basin to fuel and pump out. We ask for local knowledge about the anchorage behind Lofton Island then cast off to settle in for the evening on the hook. We do a few practice anchor and retrievals before finding the perfect location. Sometimes we call this the anchor dance. 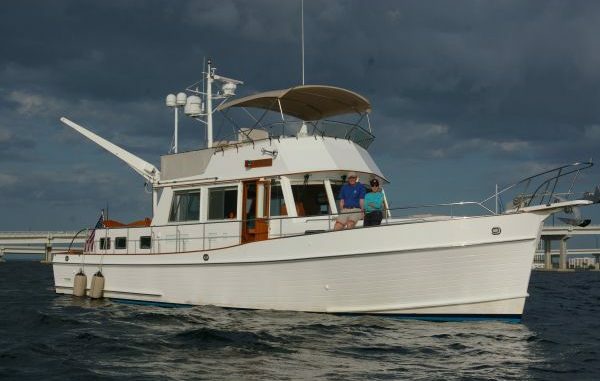 This Grand Banks is a comfortable boat, very seaworthy for the rougher days and easy gliding for the calm waters of Florida’s West Coast. The dinghy launch is simple and the cabin visibility is great. The Cats push us along at cruising speeds with no trouble, noise or smelly smoke. Our two days are a success and now I have to get back home to the other side of the waterway. We launch the dinghy and load my gear aboard for the ride back to the Yacht Basin where the car is. 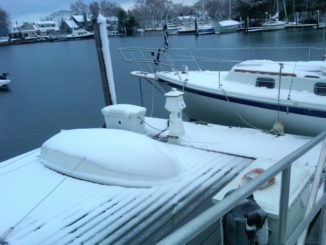 The proud new owners continue their vacation and break in period with a few days north to Sarasota then back across the OWW and up the Atlantic ICW to Melbourne, FL their summer home port. 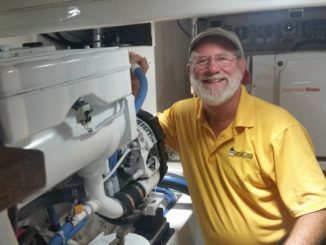 Boat Maintenance Seminar – New Date Added! DUE TO POPULAR DEMAND!!!! 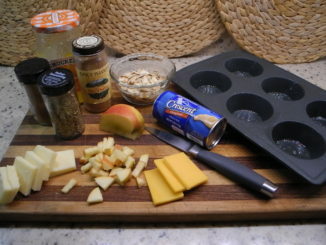 We’ve added another February date for this hands-on seminar! !